Malaysians are right to protest the recent amendments that the government made to the Evidence Act of 1950. Although they deal specifically with the internet, the amendments could have wider implications on media freedom, democracy, and human rights. This means that a blogger or forum moderator who allows seditious comments on his or her site can be held liable under the law. An internet café manager is accountable if one of his or her customers sends illegal content online through the store’s WiFi network. A mobile phone owner is the perpetrator if defamatory content is traced back to his or her electronic device. Critics of the amendment contend that under section 114A, a person is considered guilty until proven innocent. Their fear is not entirely baseless. Indeed, the Thai government has used a similar law to prosecute a blog moderator for an allegedly seditious comment which she approved to be posted on her website. The amendments are supposed to empower authorities to prosecute people publishing seditious, libelous, and harmful content on the internet. But it doesn’t take a whole lot of imagination to envision how these same authorities could abuse the law to restrict media freedom, violate the privacy of individuals, and curtail the human rights of ordinary internet users. A provision in the new anti-cybercrime bill is just the latest in a series of excessive libel laws. 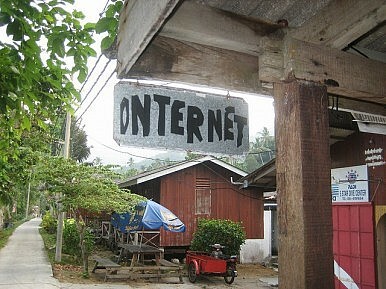 Southeast Asia's Internet Dilemma Europe Must Support Democracy in ThailandHard Times for Press Freedom in AsiaCambodia's "War" On Internet CafesAn Early Election for Malaysia?